A few posts ago we talked about acid in your well water and the damage it can cause to your plumbing system- check it out if you missed it the first time around or need a refresher. So, how then do we get rid of that acid? Quite simply, we install an acid neutralizer. Remember that rain picks up carbon dioxide from the air and forms carbonic acid. If the rain water passes through a layer of limestone in the ground, the acid is “removed”, or rather, it is neutralized. A neutralizer acts like the layer of limestone. It is a tank filled with crushed limestone called Calcite. Water passes through the calcite dissolving some of it which raises the pH of the water. Calcite, being an alkaline mineral, neutralizes the low pH acid water, much like adding hot water to cold in order to get warm water. The diagram to the left is of an automatically backwashing neutralizer. When water flows down over the calcite, it tends to pack the mineral causing restriction of flow (low pressure). In addition, the calcite tends to catch some sediment that is in the water. Periodically (about every 4-6 days) the system will backwash (flush) itself. Water flow is reversed and lifts the calcite so as to “fluff” it up, and captured sediment is flushed out. The water used for this process is washed down a drain. In some cases where the pH is very low, we mix magnesium-oxide with the calcite creating a “super mix”. Also, depending on the pH and the size of the plumbing system, larger neutralizer tanks will be used. In this piece of equipment water flows down the center of the tank through a tube and UP through the calcite. There is no backwashing. The constant flow of water keeps the calcite “fluffed up”. However, the downside is that sediment will gather in the stone bed and the calcite causing the need for periodic re-bedding. Personally, I like the automatic back wash. However, the up flow is more economical, so if money is tight, this can be the way to go. Both types of neutralizers need annual servicing. The calcite dissolves and needs replenishment. Finally, there is one more type of neutralizer: The Soda Ash or Chemical Feed Pump system. This system is used for a very low pH or for water that has a high level of dissolved solids. 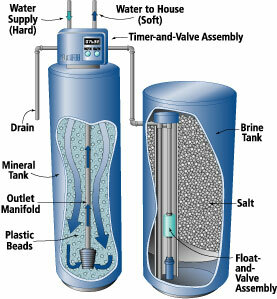 This system pumps a solution of soda ash and water into the water before it enters the well water tank. It is very high maintenance and rather noisy. But, if you need one, you need one. Thanks for reading- contact us with any further questions on this topic and check back next week for a new entry!